We start this post off with some sad news: over 65 restaurants closed in the Atlanta area in 2017, many of which have graced the pages of Date Night. We will no longer eat fried chicken (and pie!) 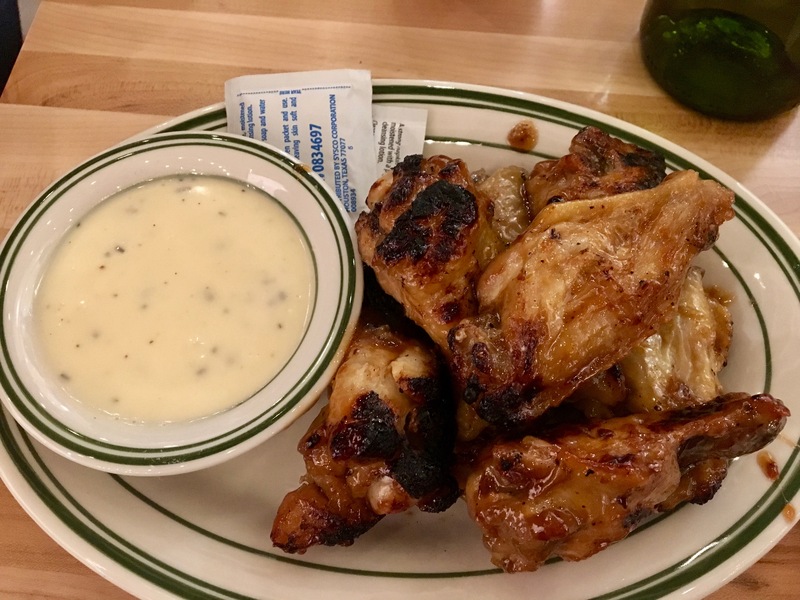 at Greenwoods, barbecue at Swallow in the Hollow, drink at Vine and Tap, have another shot at the beer wall at The Pub, or split a giant Fred Flintstone rib at the Rib Ranch in Marietta. However, with a new year comes new beginnings. 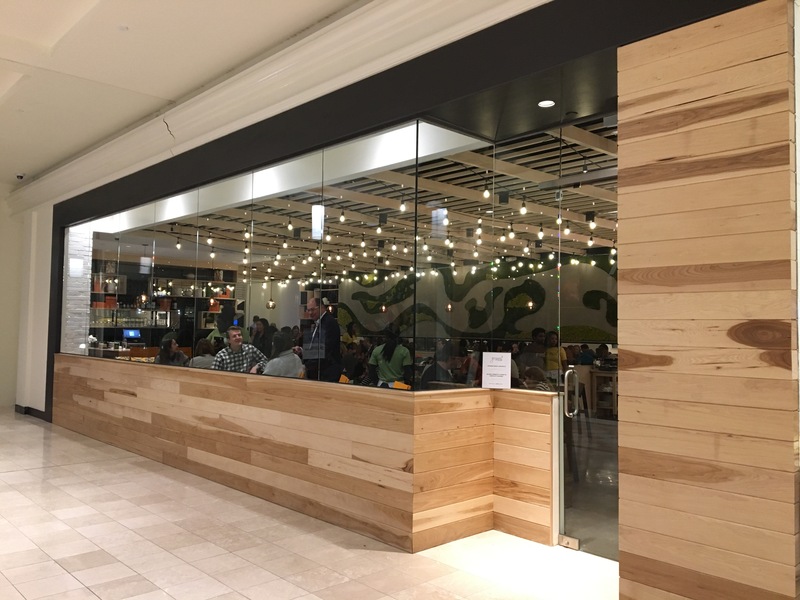 And a new pizza place in Phipps Plaza. 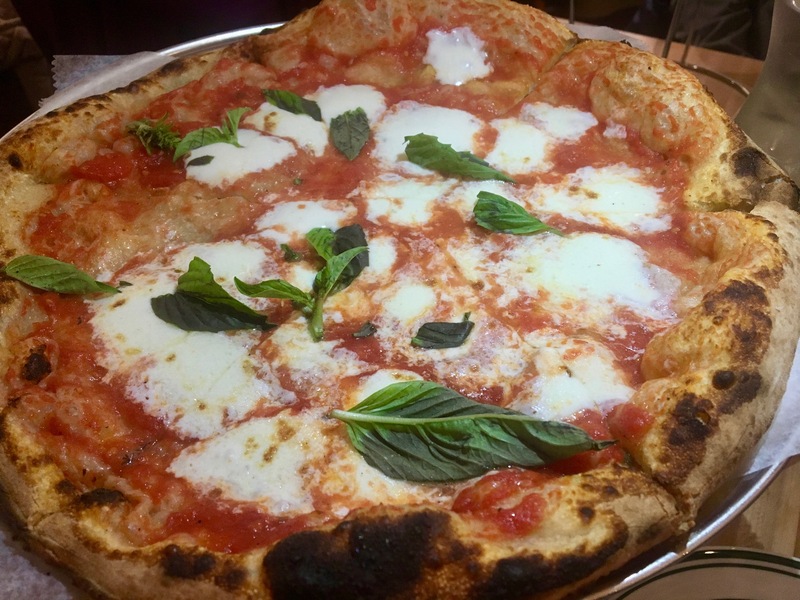 Genuine Pizza is Miami-based, with four stores in “The 305”, as the cool kids call it. This is their first foray into Atlanta. Judging by the part that faces the mall, these guys mean business. 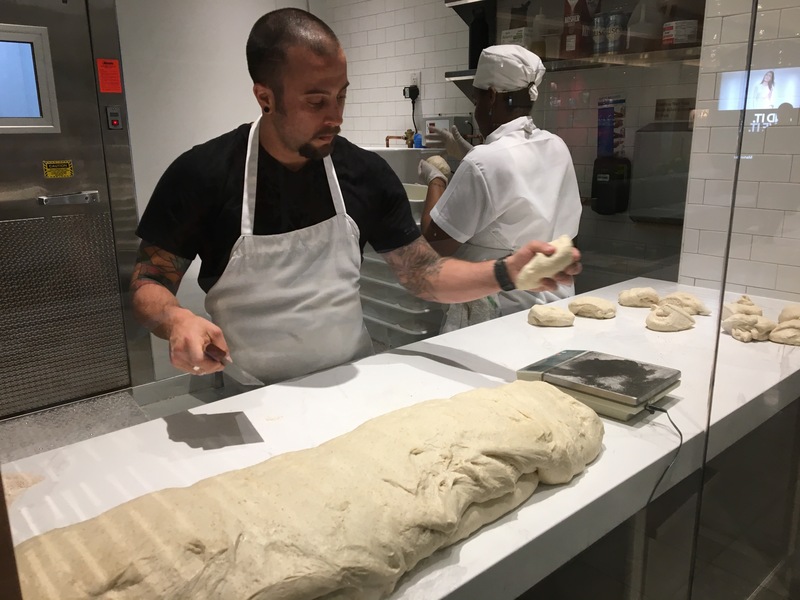 They roll and measure the dough so all shoppers can see. They will go through a lot on this busy night. Tonight is preview night at Genuine Pizza. It’s the night when friends and family come to help the restaurant staff work out last-minute kinks before they open on January 5th. We’ve got a connection because our son did some work for them. He’s here tonight along with his adorable girlfriend, so you will see a lot of food tonight. 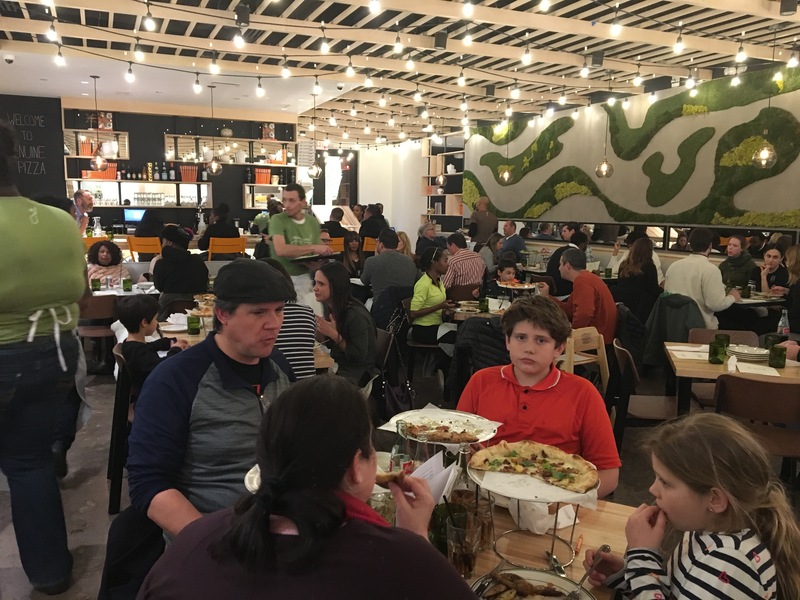 Apparently, Genuine Pizza has a lot of other friends because the place is packed. It’s sort of like one of those shows on the Food Network where everyone shows up at the same time. There’s chaos here, but it’s controlled. We are expecting some service hiccups, but whoever did the staff training has done a nice job. There are no burps at our table and our server will be ready when the restaurant opens. 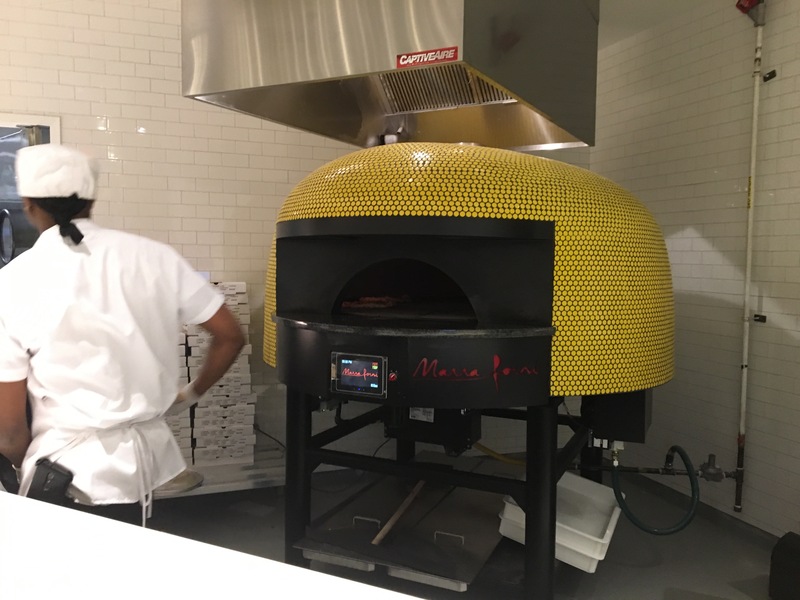 The star of the restaurant is this gen-u-ine, gas-fired Italian pizza oven. There’s a turntable inside that spins at the perfect speed. Put your pizza in and a few minutes later it’s spun to the front. As we shall see, that oven puts out some gorgeous pies. While we wait, I ask a manager what are some of the things we must order while here. 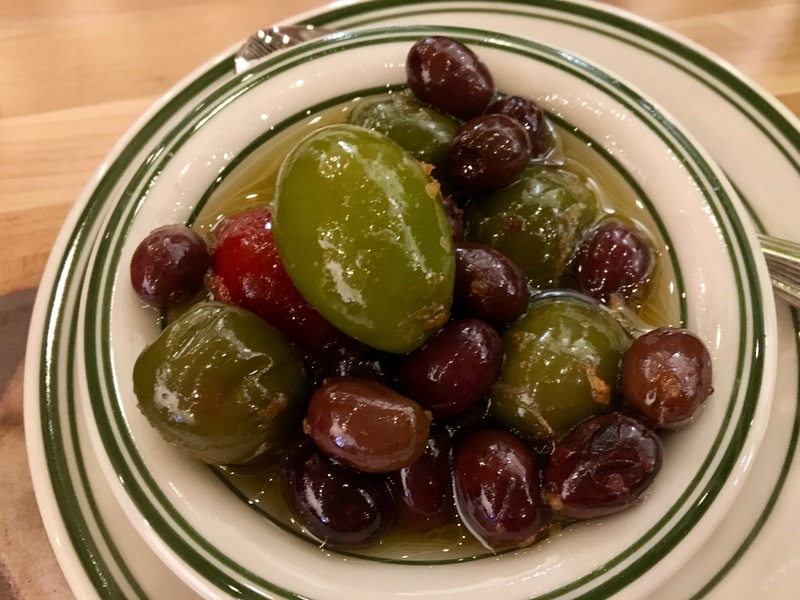 He really likes the olives. Those cute little ones have seeds. Evidently, the red one is the delicacy of the plate, so if you get one, make sure you snag it. 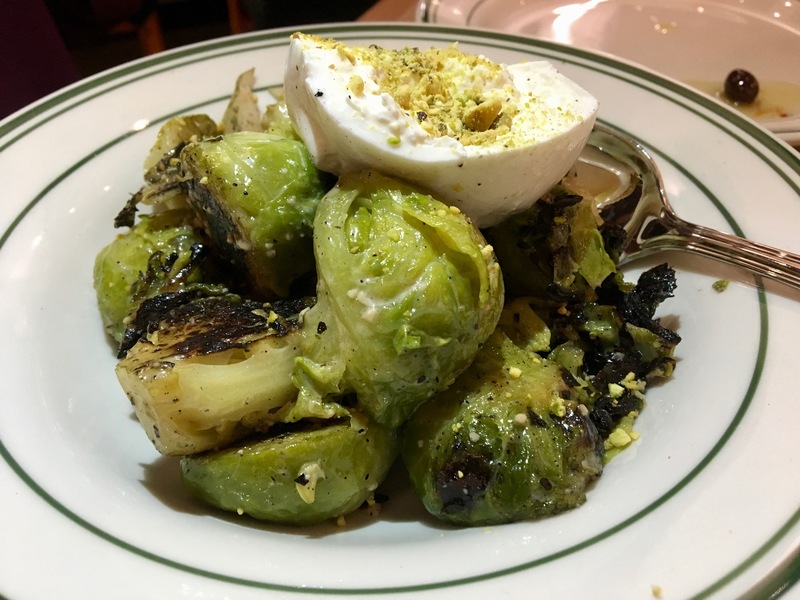 Also recommended is the Brussels sprouts with burrata. Don’t miss this one. The sprouts are grilled and then topped with a dollop of cheese. It’s an excellent take on that vegetable that you refused to eat as a child. During the wait for our table, many people were chowing down on the wings. Look how big those things are. They must have come off of some very large chickens. 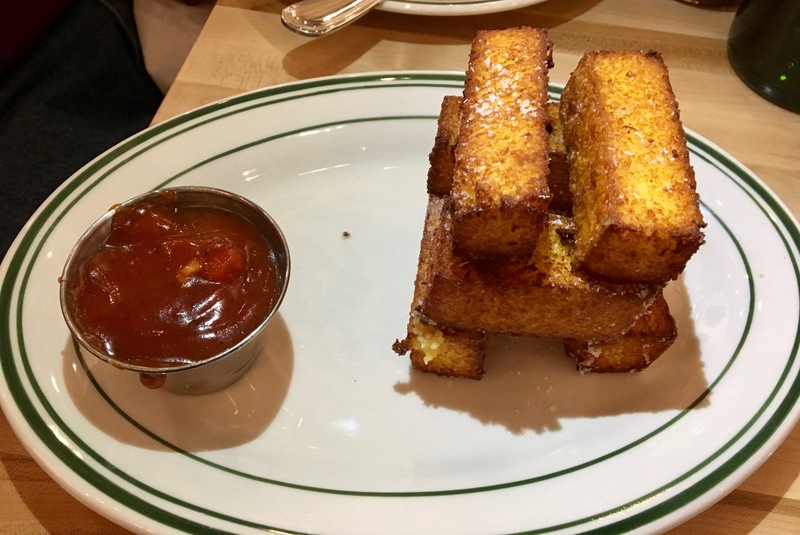 Check out another menu favorite, the fried polenta, served with spicy ketchup. Anyone up for a game of Jenga? We give them extra points for presentation. Four pizzas spin out of the oven tonight. 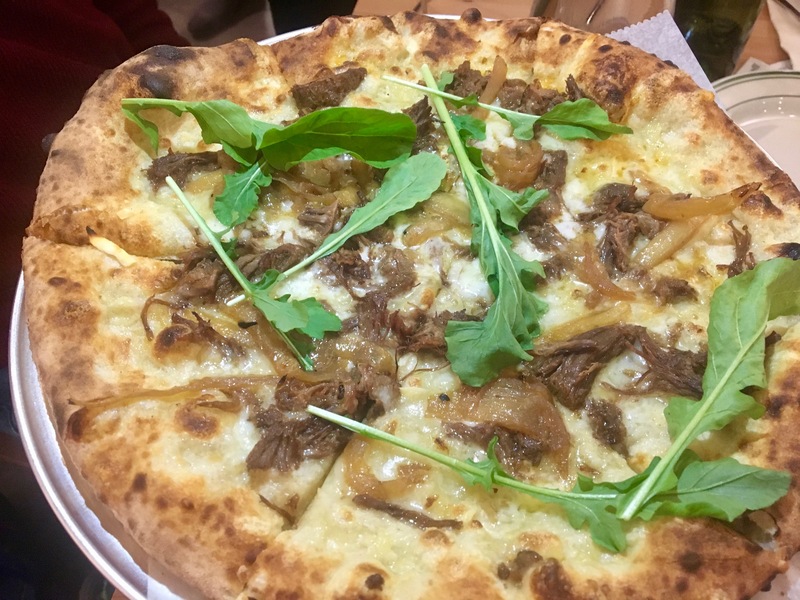 First up is the short rib pizza. They put tender short ribs and carmelized onions on the pie. Notice that this one has no red sauce. 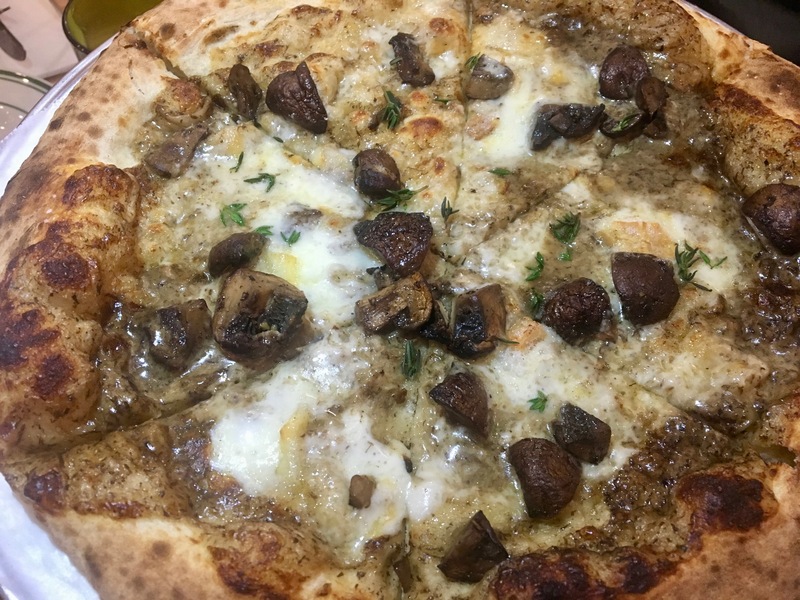 The mushroom pizza has no red sauce either. This was the only pizza that had no leftovers. Eve likes her pizzas simple, so we get her a Margherita. This winds up as our only pizza with red sauce. They feature a seasonal pizza that changes every month or so. 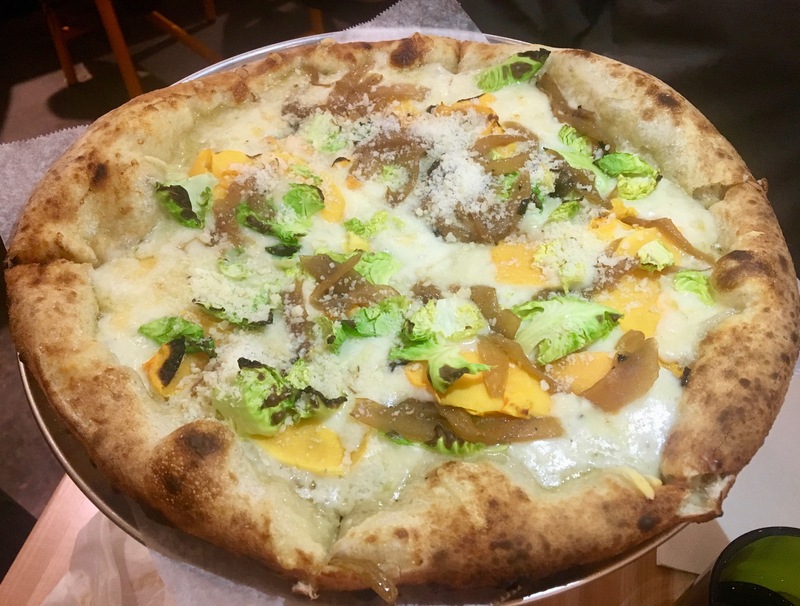 Tonight’s is the Calabaza, Brussels sprouts with butternut squash, onions, and crema. The flavor textures are quite good on this one. You get the crunchy sprouts and squash along with the soft onions and cheese. Before we go, we sample a couple of desserts. 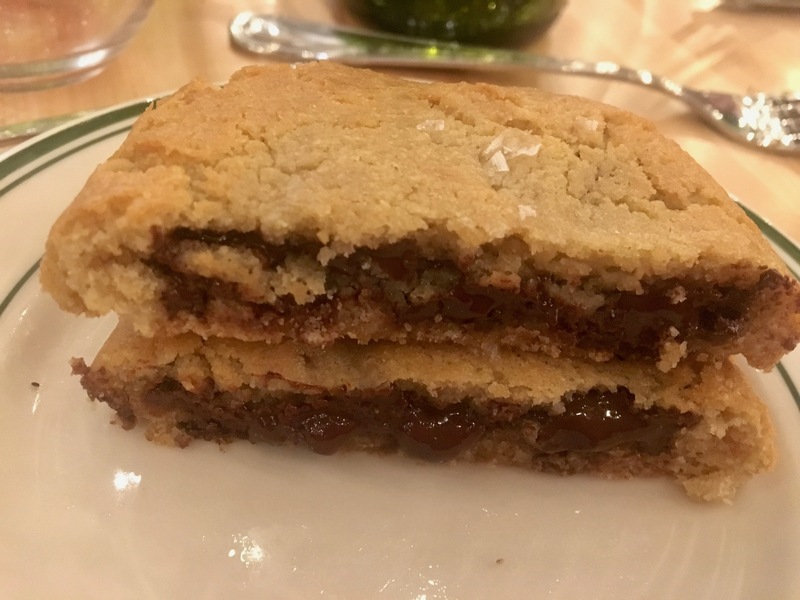 First, the warm chocolate chunk cookie. This maybe could have been a bit warmer, which would have made chocolate a bit gooier. 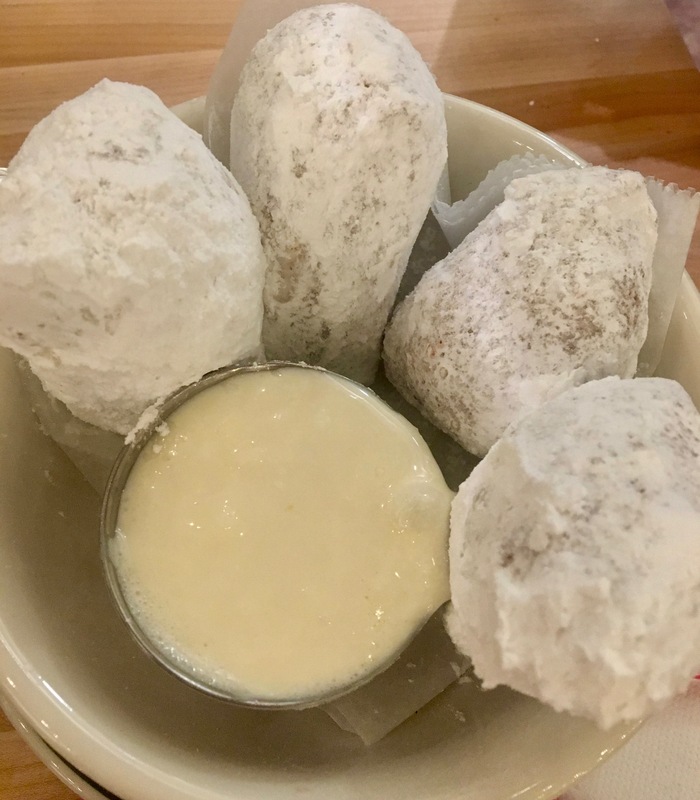 We like our desserts messy, which is why everyone should eat zeppole. Go ahead and dip them in the honey ricotta sauce and enjoy. And while you are at it, get some powdered sugar on your sweater. You can lick it off when you get home. The bottom line on Genuine Pizza: It’s genuinely good. We can’t handle the high prices of the stores at Phipps (my mother’s favorite place in the world to shop), but this is food that everyone can afford. We enjoyed everything we ate tonight. You could certainly get an appetizer, split a pizza with your date, get a dessert and walk away full. With almost a dozen pizzas to choose from, you can’t pick wrong. Disclaimer time: Since this was a friends and family night, Date Night did not pay for our sampling of the Genuine Pizza menu. Our words, however, are priceless. Welcome to Atlanta, Genuine Pizza. Live long and prosper.